The track "Timecode" seems to be an edit of Lipps Inc.'s "How Long". Synth-pop. Some people love it, some people hate it. 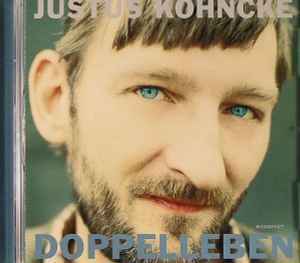 I'm pretty neutral about it, so Justus Köhncke's DOPPELLEBEN actually sounds fine to me. Opening with the beatless "Elan (Dub)," the album doesn't show its pop hand until "Schwabylon," which has more of a lounge feel than anything. The start-stop samples and mellow folk guitar of "Wo Bist Du?" back up Köhncke's slight, wavering voice as it builds to a symphonic chorus. "Loreley" has an almost ethnic rhythm and a mournful cello, and the deep and ambient "Mu Arae" has a satetly grace. There's something pleasingly cheesy about "Weiche Zäune" -- it has the feel of a lo-fi home recording -- and that lends it a certain charm (the same goes for the more minimal "The Answer is Yes"). The solid techno of "Elan" or the digital funk of "Timecode" almost feels out of place amongst the pop, but it shows off Köhncke's talent at songcraft. But the best tracks on here have a certain romanticism to them: "Herz Aus Papier" is simple but has little hints of longing in the vocals, while "Alles Nochmal" has a simplicity that underlines the emotions underneath. "The Answer is Yes" - nice use of violins here. Has a good feeling. "Timecode" is a retro sounding synthpop piece that really works. "Schwabylon" Good use of the vocoder. Funky disco sounding. More of a club piece really. The rest is just bad. Can't recommend. There's just too much of a hip-hop feel for this record to work in the aggregate. Not sure why Kompakt released this. I'm not exactly sure why this album has such a low rating; it's a very well rounded album from Justus. Maybe people just bangers and ambient from Kompakt releases. People seem to love his singles, why not the albums? Anyway, Doppelleben has awesomely funky tracks like "Elan" and an edit of "Timecode", eerie soundscapes in "Mu Arae" and "Loreley" and of course, lost of good technopop. Everyone know Justus is a pop-loving romantic. If you don't like that there's a few familar titles from his previous singles, well, they're all different versions. I love a straight ambient or propulsive techno Kompakt album as much as anyone, but I'm glad they release albums like Doppelleben too.